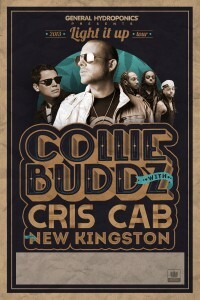 Bermuda reggae star Collie Buddz’s show at Boston’s House of Blues went ahead last night [Apr. 20], a day after the city emerged from lockdown following a massive manhunt for the bombers who detonated improvised explosive devices during Monday’s marathon. Collie Buddz fan Christopher Weedon, a Bermuda-born graphic designer who now lives in Connecticut, posted at his Facebook page that the Bermudian performer delivered an “epic show last night in Boston” at the popular venue near the city’s Fenway Park baseball stadium. Special guest Cris Cab and New Kingston — a Brooklyn band which reggae with R&B and hip-hop to create their New York-meets Jamaica sound — appeared on the same bill as Collie Buddz. Earlier in the week it was feared the Boston performance — the fourth gig in Collie Buddz’ current “Light It Up” tour — might be cancelled or postponed because of the security clampdown which was in place while the search for the bombers was underway. Dzhokhar Tsarnaev, the 19-year-old man accused in the Boston Marathon bombing that killed three people and injured more than 180, remains in serious condition at a city hospital after being arrested following a shoot-out with police on Friday. His brother, 26-year-old Tamerlan Tsarnaev, was killed in a firefight with police following a wild chase into the Boston suburb of Watertown on Thursday night.